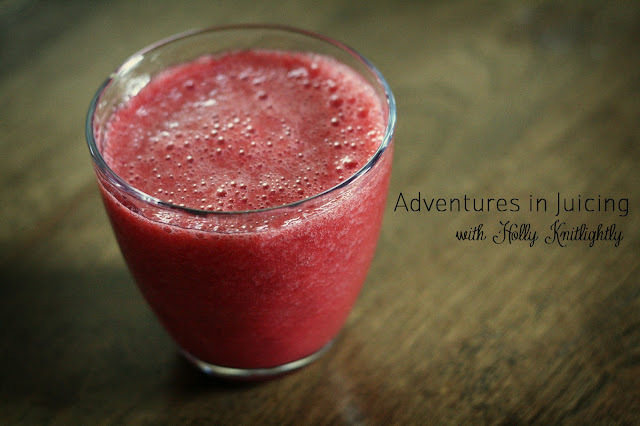 Holly Knitlightly: Adventures in Juicing Part 3! Adventures in Juicing Part 3! This really pretty green juice is made up of lots of kale, some celery & an apple. The celery was way too overpowering, it seemed to turn the drink salty, so next time I'll be sure to add in another apple and maybe a bit less celery. I made some of it for my Dad & he seemed to love it though! This weekend I actually tried another drink with some celery (and a bunch of other things, I'll be posting about it later!) and it was delicious. I just should have thrown in some more apples. This was one of the first juices that I tried making, and now I know to test it before I pour it into the glass... haha. Make sure it's not too bitter or sweet and that nothing is too overpowering. I never would have guessed that something like celery juice had so many awesome health benefits! And it's helpful for insomniacs, awesome. I'll definitely have to try drinking some before I go to bed some night & see if I'm able to fall asleep easier. Have any of you guys been juicing? Are you liking these juice posts? Even if you guys don't have a juicer I hope that you are still getting something out of the health benefits, you could just blend the fruits/vegetables to just simple eat them! If you have been juicing, let me know what I should try out! Any suggestions would be awesome. Eek sorry, J! I thought I replied to this already! I would suggest just a tiiiiiiiiiiiiny bit of celery! I made the mistake of putting a bit too much in & it was really overwhelming! It seemed to be really salty, too! So just maybe ONE stalk... or half of a stalk! & load up on apples & carrots! I don't juice or even have a juicer, but I love your posts! I can't wait to get a juicer! All of the variety of juice mixtures sound so yummy! And healthy! Oh man I love these juicing adventures! I think my housemate owns a juicer, I'm going to see if she'll let me borrow it for a try!